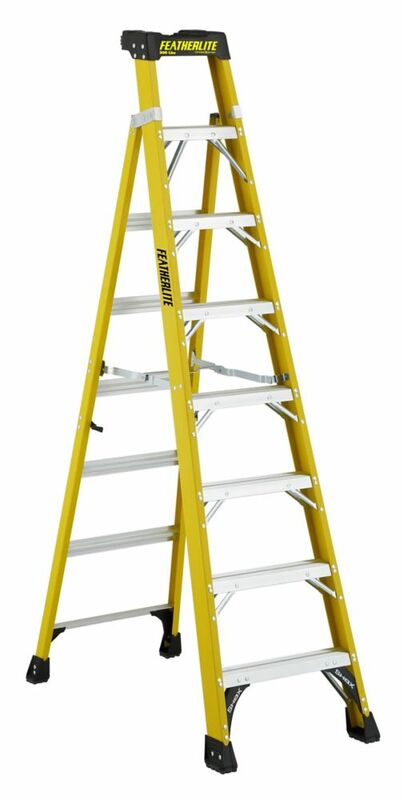 This Featherlite 8 foot fibreglass Cross Step ladder has a Type IA duty rating with load capacity of 300lbs. This ladder combines the Shelf and Step Ladder for a 2 in 1 combination made to take on multiple placement locations. The shelf design and its unique V-Shape top and innovative locking mechanism allows for positioning against a wall, building, or pole. When unlocked, this ladder sets up as a regular step ladder. The angles of the step ladder allow the user to get closer to the work area. This ladders top also features a magnet and multiple slots that allow quick and easy access to your tools. Other features include the SHOX impact absorption system, heavy duty boots with slip resistant tread, inside spreader braces that protect the ladder during transport, heavy duty reinforcements and double rivets. The Featherlite FXS6908 fibreglass Cross-Step ladder meets or exceeds the safety standards set by ANSI, CSA, and OSHA. Louisville Ladder Corp warrants its retail products to be free from defects in material and workmanship, excluding normal wear and damage from mishandling, misuse or abuse for 90 days from date of purchase. The foregoing is in lieu of and excludes all other warranties, expressed or implied including, but not exclusively, WARRANTY OF MERCHANTABILITY OR THAT THE PRODUCTS IS SUITABLE FOR THE BUYER'S PARTICULAR USE. The Company shall not be liable for any consequential damages which may occur. This Featherlite 6 foot non-conductive fibreglass step ladder has a load capacity of 250lbs, rated Grade I. This ladder is equipped with a top with tool slots, heavy-duty gusset bracing, slip-resistant rubber shoes, pinch-proof spreader arms, wide back braces, and double-rivet step construction. The Featherlite FL-3110-06 stepladder meets or exceeds the safety standards set by ANSI, CSA, and OSHA. This Featherlite 6 foot fibreglass step ladder has a load capacity of 225lb, rated Grade II. This ladder is equipped with a molded top with tool slots, molded pail shelf, slip-resistant rubber feet, steel gusset bracing, and pinch-proof spreader arms. This ladder is ideal for painting. The Featherlite FL-3210-06S stepladder meets or exceeds the safety standards set by ANSI, CSA, and OSHA. This Featherlite 28 foot aluminum extension ladder has a 250 lb load capacity, rated Grade I. This ladder features outside slide guides, D-shape rungs fully serrated for a slip resistant surface, mar resistant rail end caps, rope and pulley, and swivel safety shoes to be used as tread down or in spike position. The Featherlite FL-2120-28 aluminum extension ladder meets or exceeds the safety standards set by ANSI, CSA, and OSHA. This Featherlite 10 foot lightweight aluminum step ladder has a load capacity of 225lb, rated Grade II. This ladder is equipped with a molded top with tool slots, molded pail shelf, slip-resistant rubber feet, steel gusset bracing, and pinch-resistant spreader braces. This ladder is ideal for painting. The Featherlite FL-2210-10 stepladder meets or exceeds the safety standards set by ANSI, CSA, and OSHA. 8 Feet fibreglass Cross Step Ladder with 300 lb. Load Capacity Type IA Duty Rating This Featherlite 8 foot fibreglass Cross Step ladder has a Type IA duty rating with load capacity of 300lbs. This ladder combines the Shelf and Step Ladder for a 2 in 1 combination made to take on multiple placement locations. The shelf design and its unique V-Shape top and innovative locking mechanism allows for positioning against a wall, building, or pole. When unlocked, this ladder sets up as a regular step ladder. The angles of the step ladder allow the user to get closer to the work area. This ladders top also features a magnet and multiple slots that allow quick and easy access to your tools. Other features include the SHOX impact absorption system, heavy duty boots with slip resistant tread, inside spreader braces that protect the ladder during transport, heavy duty reinforcements and double rivets. The Featherlite FXS6908 fibreglass Cross-Step ladder meets or exceeds the safety standards set by ANSI, CSA, and OSHA. 8 Feet fibreglass Cross Step Ladder with 300 lb. Load Capacity Type IA Duty Rating is rated 4.8 out of 5 by 5. Rated 4 out of 5 by gghobbit from Great ladder Bought this ladder for work and am very happy with it. The ladder has some very nice features like the magnetic tray on top and the fact you can use it against a wall or pillar. I just wish it was a bit lighter but then it would not be a well built. Rated 5 out of 5 by Steve from Sturdy and Stable Much sturdier and more stable than my old aluminum one. A little heavier but well worth the small additional weight. Really like the ability to lean against walls and posts. Rated 5 out of 5 by Dma123 from Step ladder I just received the Step ladder, and I am very impressed! Thank you so much for a quality product that I know I will use for a very long time!